Archaeologists exploring the remote mesas of northern Arizona have uncovered a trove of previously undocumented rock art, including more than 1,500 petroglyphs, and confirmed the presence a prehistoric solar calendar, which has been marking the seasons for more than 700 years with a striking “shadow dagger” that travels across its sandstone face. Researchers made these finds in the backcountry of Wupatki National Monument northeast of Flagstaff, which includes the ruins of dozens of sites built by Ancestral Puebloans known as the Kayenta and the Sinagua. Experts with the Museum of Northern Arizona [MNA] and the National Park Service set out to explore the isolated reaches of the monument in 2014, in order to document the full extent of the rock art and other features that scientists had not studied in decades or, in many cases, had never seen before. “As a result of the current project, the NPS now has a complete library of photographic images of every panel, every element, and every feature [in the study area]”, said MNA’s David Purcell, who supervised the study. Over nearly two years, including many special visits to watch the interplay of sunlight at certain spots during equinoxes and solstices, the researchers combed areas known as Horseshoe Mesa, Middle Mesa, and an unnamed landform that they dubbed Little Mesa. In that time, they documented 122 panels of petroglyphs at Horseshoe Mesa — 50 of which had never been recorded before — and 107 panels at Middle Mesa, 88 of which were new to scientists. Many of the panels contained several, sometimes dozens, of individual petroglyphs, resulting in more than 1,500 separate glyphs being recorded for the first time. 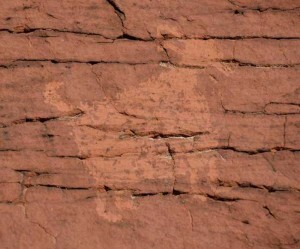 The most recent markings include graffiti made by American travelers in the late 1800s, and historic-era images of horses, barns, and cattle, sometimes with visible brands, scratched into the rock by Navajo inhabitants. But the study also turned up evidence of human occupation dating back farther than some researchers expected — including petroglyphs and a lone stone artifact that are typical of the so-called Late Archaic period, which dates back as much as 4,000 years. “The most significant finding was the discovery by MNA Archaeologist Nancy Mueller of a complete Elko Corner-notched dart point [a style that dated from 1500 to 4000 years ago], as well as the finding of Panel 92, an isolated [petroglyph of a] bighorn sheep of the Glen Canyon Linear style, which suggests a Late Archaic presence at Horseshoe Mesa,” Purcell said. However, he noted, the majority of the petroglyphs documented by the team seem to be the work of the Ancestral Puebloan group known as the Kayenta, which lived in the Wupatki area from about 1150 to 1300. “The rock art and the associated artifacts are solidly within the Kayenta tradition, although we have seen a few Sinagua potsherds,” Purcell said. 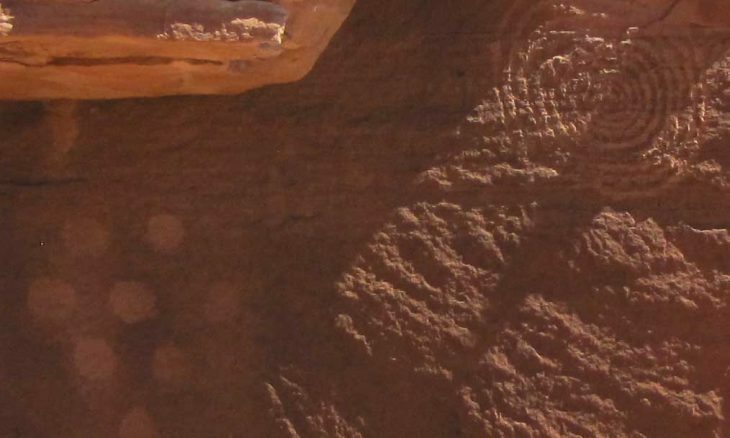 And among the Kayenta petroglyphs, the ones that caught the researchers’ attention most were a cluster of geometric forms found on the southern face of a sandstone ledge on Horseshoe Mesa’s northern end. Labelled Panel 50, it was originally recorded by archaeologists surveying the area in 1931 and wasn’t suspected to have played a role in tracking the movement of the sun until the 1990s. But whether it did, and how, remained unclear for decades. Purcell said the new research confirms that Panel 50 is indeed an “imaging calendar” — a time-tracking feature that uses the play of light and shadow — to mark the winter solstice, as well as the spring and fall equinoxes. While the area around it is crowded with a variety of images, the calendar consists of only two large motifs, Purcell explained. First, on the left or north side of the panel, partially protected by a rock overhang, is a set of eight circles, each 7 to 9 centimeters (3 to 4 inches) across, arranged in rows of two, three, two, and one. To the right, under another small projection of rock, is a large spiral, which winds counterclockwise into a coil 10 lines deep. Using video and time-lapse photography during the “solar milestones” that mark the start of each season, the archaeologists observed the appearance of what they call a “shadow dagger” that interacts with these two elements in a unique way on those days. On both equinox days, the calendar begins totally immersed in shadow, until exactly 12 noon local time, when sunlight first falls on the panel, striking the projection of rock above the spiral, and forming the triangular shadow. “This is the most dramatic, but not necessarily the most important, interaction observed,” Purcell said. At the same time, to the left, the clutch of eight circles is encroached upon by another shadow, cast by the outcrop overhead. This shadow falls precisely along the bottom right edge of the grouped circles — at the same moment that the dagger bisects the spiral. And as time passes, the shadow moves up, covering some rows of circles in darkness, while leaving others in the light. “We think that somehow this provides a countdown to the equinox or a count from the equinox to some other important date, such as planting,” Purcell said. Finally, another unique interaction takes place on the equinox, at sunset. 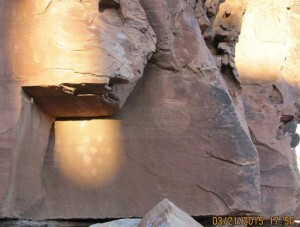 At that time, light passes through a natural crevice in the mesa opposite the panel, forming what the researchers call a “bar of light” that touches the upper left edge of the group of circles. And the day after the equinox, again at sunset, this bar completely covers the whole group of circles, and touches the edge of the spiral, before receding. 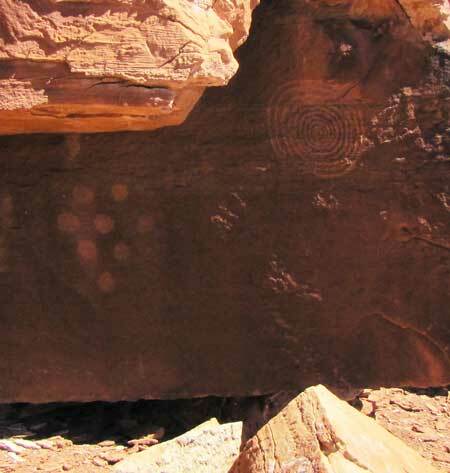 A few other rock-art sites in Wupatki have been thought to be solar calendars, he added. But none of them, so far, has demonstrated the complexity and specificity observed in Panel 50. “When [those other petroglyphs] are viewed in the context of the whole panel, during the course of a day, they are simply part of the sunlight and shadow play that is visible on all of the panels,” he said. By contrast, Panel 50 shows that its creators had an intimate knowledge of the equinoxes and the solstices, and how the light of those days fell upon that particular site. “The shadow pointer and the light bar have played out on the cliff face at Horseshoe for centuries or millennia, season after season,” Purcell said. Given that the panel, like many of the glyphs around it, was crafted by the Kayenta, he added, it’s possible that Panel 50 is a local manifestation of the same knowledge that the Ancestral Puebloans used to craft solar calendars elsewhere. “The ethnographic literature is clear that ‘sun priests’ or ‘sun watchers’ are a common and important role in historic Puebloan society, and the timing of ceremonies and dances requires careful observation of solar milestones,” he said. And Panel 50 has much in common with Chaco Canyon’s now-defunct calendar known as the Three Slab Site — where three sandstone panels placed on end created a dagger of sunlight that either bisected, framed, or grazed an etched spiral, depending on the season being marked. “I believe that the Horseshoe Mesa solar calendar is very much within the tradition of the Three Slab Site,” Purcell said. In an effort to learn more about Panel 50 and what it can tell us about the Kayenta, their ties to Chaco, and the prehistory of northern Arizona, Purcell and his colleagues are continuing to study the thousands of photographs, maps, and hand drawings that the team has produced. Among the questions they’d like to pursue: Why does the Horseshoe Mesa calendar mark the advent of every season except summer? “The shadow pointer does not mark the summer solstice, and the other interactions visible on that day are not completely convincing as solstice markers, so we believe that the people who made Panel 50 were probably not there to observe the summer solstice,” Purcell said. “Since the summer solstice really marks mid-summer, not the beginning of summer, in northern Arizona, the date with which they would have been concerned is the beginning of the Monsoons, which averages July 4. 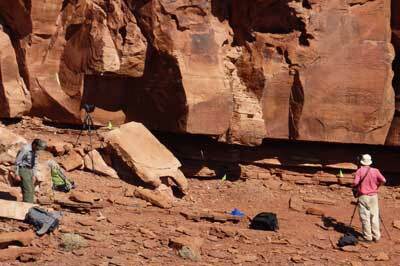 For now, the abundant new insights this research has provided into the rock art of Wupatki adds to the evidence of just how complex the Ancestral Puebloans’ understanding was of the natural world. “Without the distractions of our technocratic culture, the people who lived at Horseshoe and Middle Mesas were fully aware of all aspects of the natural world around them,” Purcell said. Photographs from this research appear in the exhibit “Images on Stone: Petroglyphs of Wupatki National Monument,” at the Museum of Northern Arizona in Flagstaff, Arizona from March 26 through September 5. For information on hikes to the Horseshoe Mesa area, see the Wupatki National Monument web site. What happened to the Chaco Sun Dagger that it is “now-defunct”? In 1989, one of the slabs shifted and effectively destroyed its ability to mark solar events. It was thought that the shift was caused by heavy erosion created by foot traffic, so the site was closed to the public in 1990. The “Sun Dagger” was not “defunct” at all. The Solar and Lunar phenomena at Chaco is one of the most prolific aspects of those ancient peoples and how intelligent and cosmic they truly were. This influence was spread throughout the 4 corners and states where these people lived and traveled. We see this by these new discoveries made. Chaco was the center of that world and time and everything revolved around it. Yes the stone slabs fell onto one another and destroyed that particular calendar but others do exist. how old are they saying the calendar is? panel 50? Purcell and his colleagues said that it and the other Kayenta petroglyphs date between the years 1150 and 1300. I am wondering what the play of light and shadow on the rock face is that marks the Winter Solstice? Other means of reckoning the exact day of the equinox might be to watch the sunrise in the East and determine the extreme Southernmost sun rising and Northernmost sun rising days, the Solstices, on the horizon and then somehow calculate the midpoint sunrise to the day. Or possibly the sun watchers knew that a stick set straight perpendicular to a flat ground acting as a gnomonic device would show no shadow at noon on the equinoxes: I wonder if the reason that some shadow/light effect on the Summer Solstice is not noticed on panel 50, considering that the researchers claim that an effect occurs on the Winter Solstice, is because the sun’s passage on the Summer Solstice does not illuminate that wall? Revision: No shadow will be cast by a perpendicular gnomonic device on the equinoxes at high noon… at the equator. How could the Ancients have determined high noon; the sun straight overhead? We were shown another very similar sun dagger calendar by a guide on the Hopi Reservation east of Wupatki NM, showing us an ancient Puebloan site there. This one had three spiral/circles, one marking the winter solstice, one the summer, and one I believe the spring or fall equinox — a fascinating insight into those peoples’ understanding of the solar cycle. If I remember correctly, this dagger actually cast shadows in the shape of a letter M, with the dagger striking the center of the circle and the legs of the M striking the edges of each of the circles on the respective dates. I’ve visited the area, learned a lot from your writing.